Sea Lion Pup born at Wildlife World Zoo, Aquarium & Safari Park! Wildlife World Zoo, Aquarium & Safari Park is excited to welcome a second baby sea lion to its family! This is a significant birth for Wildlife World, as well as for marine mammal enthusiasts and conservationists alike. The pup was born several days ago and is the first baby born to his mother, Andi. Sea Lions are highly intelligent animals. They are known for their ability to learn complex, voluntary husbandry and medical behaviors through operant conditioning principles and positive reinforcement. In fact, Andi was already voluntarily participating in maternal husbandry behaviors, such as ultrasounds, long before the pup was conceived. By participating in her own health care, the animal care team, including 2 veterinarians, a veterinary technician and 3 specialists, were able to better monitor Andi and her baby’s health, ensuring the birth of a healthy pup and maintaining the health, comfort, and well-being of mom. Wildlife World’s exhibit was carefully designed, with the hope of one day starting a successful sea lion breeding program, in an effort to maximize genetic diversity within the zoological population. 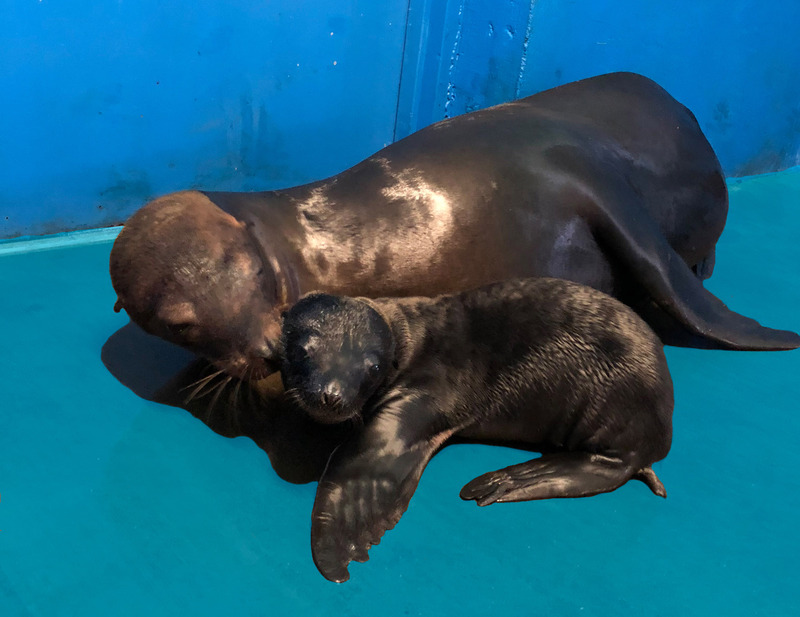 With approximately one-hundred and fifty thousand gallons of man-made salt water for the sea lions, the expanding sea lion family have plenty of room to raise the new pup. The spacious outdoor exhibit allows visitors to attend a public educational demonstration featuring these acrobatic animals. In addition, Wildlife World offers guests the opportunity to feed the sea lions during their scheduled feeding times. Wildlife World’s expert sea lion care team is committed to providing the best care to their animals and engaging, informative, and fun educational experiences for visitors of all ages! In fact, each year Wildlife World offers savings for parents and schools, enabling eighty thousand students the opportunity to discover and learn about more than 600 species of birds, fish, mammals, and reptiles. Like all marine mammals, sea lions are protected by the landmark legislation known as the Marine Mammal Protection Act (“MMPA”), first passed in 1972. The MMPA makes it illegal to hunt or harass any marine mammal species found in U.S. waters. Sea Lions, like many marine animals, face an uncertain future due to ocean pollution, dwindling fish stock, and competition with human activities. The energetic sea lions are seen daily at “Shipwreck Cove,” a pirate ship display with upper deck and underwater viewing. With an outdoor exhibit pool, public seating, and a viewing area for the sea lions, there is plenty of opportunity for guests to soon come out and see Arizona’s newest sea lion pup explore its new surroundings. With more than 600 species & 6000 animals on display, there are always new arrivals at Wildlife World! Other babies on display include a baboon, spider monkey, flamingos, penguins & several hoofed animal species, including wildebeests and other youngsters throughout the 100-acre park. As an USDA licensed, private institution, accredited by the Zoological Association of America (ZAA) and the Alliance of Marine Mammal Parks & Aquariums (AMMPA), Wildlife World Zoo, Aquarium & Safari Park receives zero taxpayer funding. No tax dollars have ever been spent to build or operate Wildlife World in its nearly 34-year history. Wildlife World Zoo, Aquarium & Safari Park is located at 16501 W. Northern Ave., Litchfield Park, AZ (SE corner of State Route 303 and Northern Ave.) Wildlife World is open seven days a week, 365 days a year, including all holidays. Zoo exhibits are open from 9:00 a.m. to 6:00 p.m. (last zoo admission is at 5:00 p.m.) Aquarium exhibits are open from 9:00 a.m. to 7:00 p.m. Admission includes access to the Zoo, Aquarium and Safari Park.